In 1241/4 the theology masters at the university at Paris with their chancellor, Odo of Chateauroux, mandated by their bishop, William of Auvergne, met to condemn ten propositions against theological truth. This book represents the first comprehensive examination of what hitherto has been a largely ignored instrument in a crucial period of the university’s early maturation. However, the book’s ambition goes wider than this. The condemnation provides a window through which to view the wider doctrinal, intellectual, institutional and historical developments within the emerging university. These include the advent of the Dominicans and Franciscans at the university; and the developing focus of Paris theologians on using their learning for preaching at a time of a rapid and sometimes divergent development of doctrine and concerns over the newly-translated Aristotelian and associated Arab and Jewish works, heresy, the Greek Church and the Jews. The book compares the condemnation’s ten articles with the major statement of Catholic principles in the first canon of the Fourth Lateran Council, 1215, and assesses what conclusions can be drawn from their apparent correlation. Its examination of the condemnation in the context of the surrounding wider developments provides the basis for a much better understanding of the university and its theology faculty in the formative years between the grant of its statutes in 1215 and the better known period from the 1250s onwards, which included major figures such as Thomas Aquinas; and this, in turn, should lead to a better understanding of the later period itself and its doctrinal and institutional developments. 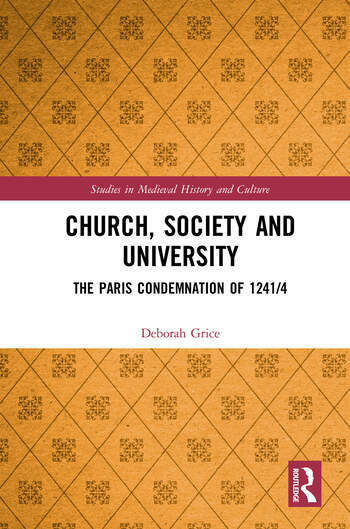 After an initial degree in classics at Oxford University, Deborah Grice had a career in the UK Home Civil Service. She then pursued an MA at Kings College London in Late Antique and Byzantine Studies and a doctorate in medieval history at Oxford University - a gradual progression forward through history. After completing her PhD in 2017 she has continued her research in the field of medieval history, in particular forbidden ideas and academic heresy, including presenting papers at international conferences and participating in workshops.